Oh joy...oh bliss...oh books ! Our local library hosted its annual book sale last weekend. Friend Ruth and I planned a date as one of our all-time favourite shared pursuits is browsing used book shops. We were both in our element. With no other agenda for the evening, no set time frame of when we had to be out, we perused to our heart's content. I did set myself a budget for my purchases -- I mean you can buy a small stack of books when hardcovers are a dollar and paperbacks are fifty-cents. I started with a $10 limit but I soon upped the ante when I saw how quickly I was filling my book bag! Although I went over my not-at-all-set-in-stone budget (ha ha), I had nary a thought for guilt... nor did I wonder where on earth I was going to stash them all. Earlier this week (after the sale) I stopped at the library to return a book I'd borrowed. And what to my wondering eye did I see? But staff setting out the 'remains of the day'. These they were giving away FREE! Of course I stopped to see... and found another 6-7 books I was drawn to pick up and bring home. Almost like stray kittens, you can't leave them to languish now, can you!! How's that for a full cupboard? Brenda, what a treasure trove! I would have been just like you, unable to tear myself away. 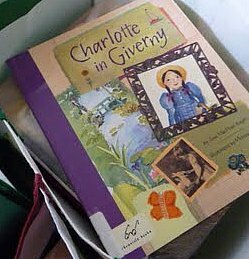 I'm interested to know more about the Charlotte in Giverny book. That is one of our most visited places in France! Elizabethd.... if you click on the title in the posting, it takes you to Amazon's listing for the book. The author has also written two others called Charlotte in Paris and Charlotte in New York. This one is adorable. Beautiful illustrations by Melissa Sweet, along side reproductions of the masters in impressionist painting. 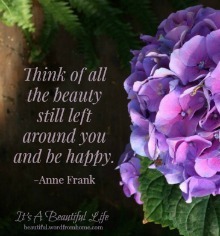 Oh the more I read your blog the more I sense we have the most kindred spirits!!! I wish we lived closer; you and I would be fast friends! I just hit the library book sale at my daughter's school and got so many of the same kinds of books. I too picked up a few by Alexander McCall Smith. I also go a bunch of Madeleine L'Engle. I spent $32! Alas, and I felt guilty but then again not if that makes sense. No one but a fellow book lover/collector could possibly understand! I'm jealous of your find So Many Books, So Little Time - that is on my wish list :-) Enjoy your treasures and I'm off to enjoy your blog some more!! What a great bunch of books you found. Have you read any of the Brother Caedfel novels? I really enjoy them. I think you have the first in the series, which I have not yet read. But every story stands on its own. 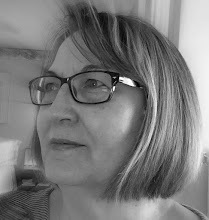 Deborah... yes, kindred spirit... isn't blogging fun when you can meet so many 'heart' friends here? Glad you enjoyed your own library book sale. Did you get the Ladies Detective series or the other ones? Mr. Smith has such a fun variety of novels. BTW, I'll try and let you know about my reading of So Many Books, So Little Time when I get to it. Lorrie...I have not read any of the Brother Cadfael books, but I've probably seen most of the DVD's. My sister read them all and decided she didn't want to see the movies made of them (they'd be all wrong in her mind then). You're right, the one I have is the first in the set. I started it right away. There are three short stories in this book. What a fun set of circumstances for you. 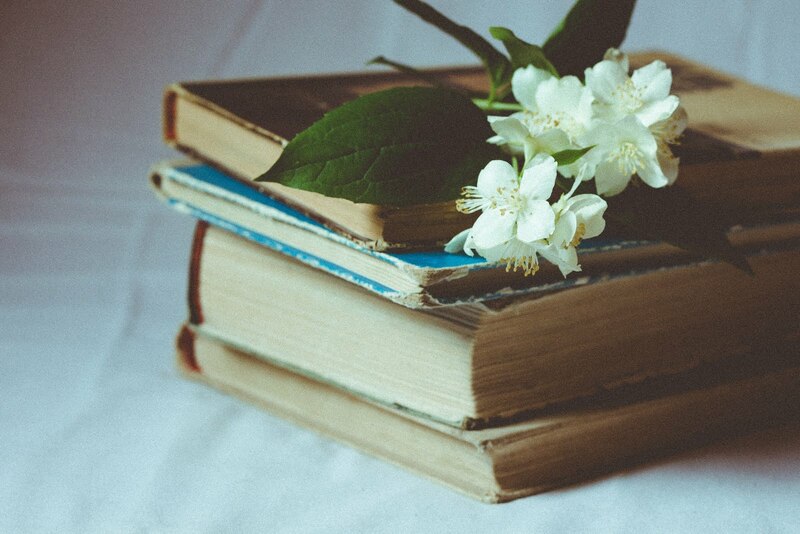 With the Winter season coming, you will be set to curl up by the fire and read until your heart's content:) You shared some interesting titles that I am keeping in mind myself. Your blog banner is beautiful! It's interesting how books call out to you...I'm in iceland but each book is $20 or about 2000 krona-but I'm loading up. hope i can make it to the airplane....lol! Wow! You got some GOOD ones. I want to read the Brother Cadrael series. Just haven't gotten 'round to it. I look forward to winter - just because it seems I get more read. Gotta love this! I love shopping for books. They are the best for of insulation a house can have!